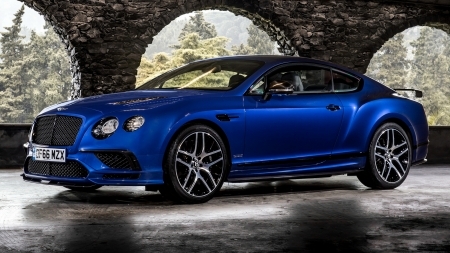 In February 2009, Bentley announced limited production of the Bentley Continental Supersports. The car was unveiled at the 2009 Geneva Motor Show, announced by Jay Leno, to be available in autumn 2009 worldwide, followed by FlexFuel-compatible models in North America by summer 2010. The first Bentley capable of running on both petrol (gasoline) and biofuel (E85 ethanol), its 6.0 litre W12 engine is rated 630 PS (463 kW; 621 bhp) at 6,000 rpm and 800 N⋅m (590 lbf⋅ft) at 1,700-5,600 rpm - using either fuel. The car can accelerate from 0 to 100 km/h (0.0 to 62.1 mph) in 3.7 seconds and 0 to 160 km/h (0.0 to 99.4 mph) in 8.9 seconds, with a top speed of 329 km/h (204.4 mph). This makes it the fastest and the most powerful production Bentley ever at the time of production. The Supersports is already known as the best handling Bentley. Bentley says the Supersports can deliver 1.29 g forces on a 300-foot (91 m) skid pad, as compared to its sibling the Continental GT speed, which can perform up to 0.98 g forces on a 300-foot (91 m) skidpad. Marco_Ghostly Uploaded by Marco_Ghostly on Sep 18, 2018 . 2017 Bentley Continental Supersports - Desktop Nexus Cars Download free wallpapers and background images: 2017 Bentley Continental Supersports. Desktop Nexus Cars background ID 2421337. In February 2009, Bentley announced limited production of the Bentley Continental Supersports. The car was unveiled at the 2009 Geneva Motor Show, announced by Jay Leno, to be available in autumn 2009 worldwide, followed by FlexFuel-compatible models in North America by summer 2010.